I hope that this post is the first in a series of short book reviews. I have a number of cycling books on my shelves that may not be accessible to everybody; either because of their age, or because they have stayed in manuscript form. I hope to scan some pages and the title of each of them, and write a few accompanying words. First to be scrutinized is Cecil Cripps, Racing the Wind!, published in Australia in about 1991/2. This is a book which has eluded me for more than a decade; I felt I could have used it when I started my own book on fast cyclists about fifteen years ago, but all I had then was a photocopied chapter. As it turns out now that was enough because Cripps starts where my book ends, chronologically speaking. Looking the book up on the internet I find only two copies, both from UK sellers, and both priced to the gunwales, if I may say so, so here we go. Please excuse the bad quality, but I didn´t want to crack the tome´s spine while scanning. What is obvious from this sample page is that the book is crammed with facts, figures, names. As such it´s an absolute gold mine. Those figures or pictures might not alway be where you expect them, so the mine metaphor gains one more meaning. The book traces the development of bicycle speed records through the decades, starting with Dr. Cortis, continuing with better known names such as Major Taylor, Mile-a-Minute Murphy and Oppy, Alfred Letourneur, José Meiffret (on whom there was a really interesting article in Der Knochenschüttler some time ago) and winding down with a chapter on some Australian recordmen after reporting John Howard´s and Fred Rompelberg´s exploits. Each of them receives many pages of dates, figures, biography and funny snippets. 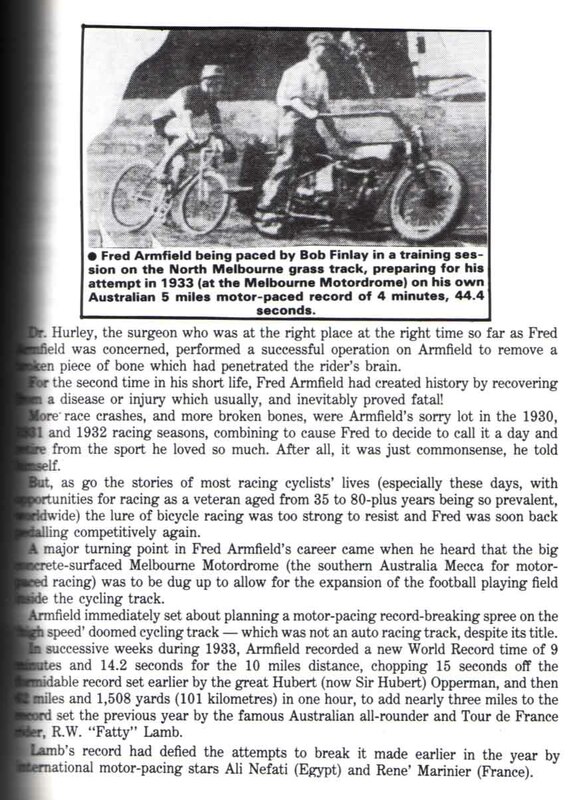 Reading the book one quickly sees that it is well written (Cripps was a journalist), excepting perhaps Cripps´ predilection for exclamation marks, and very factual (he was a racing cyclist too). It is proof of the fact that something that looks amateurish can be very useful indeed. It says in the book that Cripps was 66 when Racing the Wind! was published; I have not been able to find out if he´s still alive, so if anyone has any additional info, please leave a comment. Cecil Cripps, Racing the Wind!, Vetsport Promotions, Chelsea, Australia, no year given. Hard cover, many b/w and colour photos and cartoons, index of names, 192 pages. Sometimes you get lucky outside the internet – a small add in the News and Views can provide enough excitement to last for weeks even at this day and age. That´s what happened about four years ago when Thanet Silverlight SL1408 was offered for sale. It was not as special as my other SL (see post below), its frame number pointing to 1949 as its year of construction, but I was tempted. Did I need another SL? But then, does one need Thanets at all, with their weird construction and soft ride? People at the time said that it worked despite its design, not because of it, and its nickname “Bristol Plough” was derived from its place of origin, and its habit of breaking its frame below the bottom bracket shell which would then send the cradle tip ploughing into the ground. But: Perhaps SLs are like emus, those supremely ugly flightless birds which may only be kept in captivity in pairs? This thought decided the matter. Also, the opportunity of getting an SL does not come often, and so I struck a deal, sight more or less unseen, as the snaps I received where not overly informative. 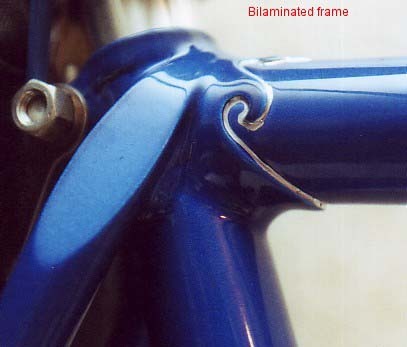 OK, I knew the frame had been extensively modernized, had received the wrong replating and many incorrect parts, and been ridden a lot afterwards, but the price reflected this. Or should I say, the fact that the bike had not been swapped or traded below the radar of any outside buyer reflected this? The seller, who had inherited the bike from a recently deceased relative, lived in Switzerland and would travel through Holland on his way from Scotland to his home on the very same day that the second issue of Stalen Ros would be staged, so after our visit to Neerkant we continued on to the Hook to meet the seller when/if he arrived on the boat. We had been told to look out for a brown 1970s VW van. And soon enough there was one of these vehicles (dare I compare it to an emu?) rolling off the ferry, to divulge my Thanet, and to disappear into the middle distance afterwards. There was a lot of work to be carried out on the Thanet; the wheels could be kept, there was a super nice Thanet handlebar extension, a modern curved seatpin, but that was about it. 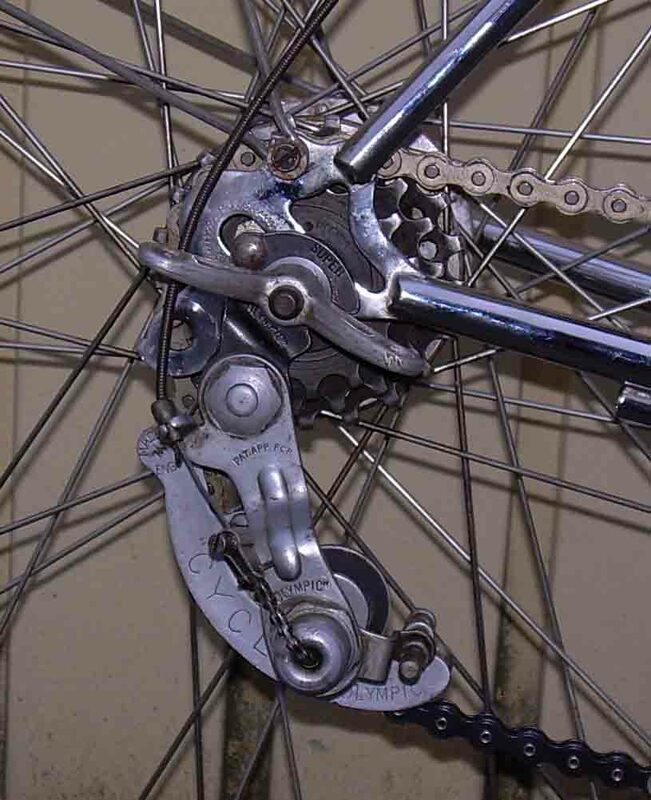 I had to take some interesting decisions – the frame had been modernized to take Campag Record, so would I go along with that, would I try to fit older parts to make it look its age, or would I go the whole hog, have it re-re-built, the chrome redone properly? I decided to go the middle way, if not for ease of working on it, then for the cost and the uncertain outcome of having paint – and chrome schemes restored. 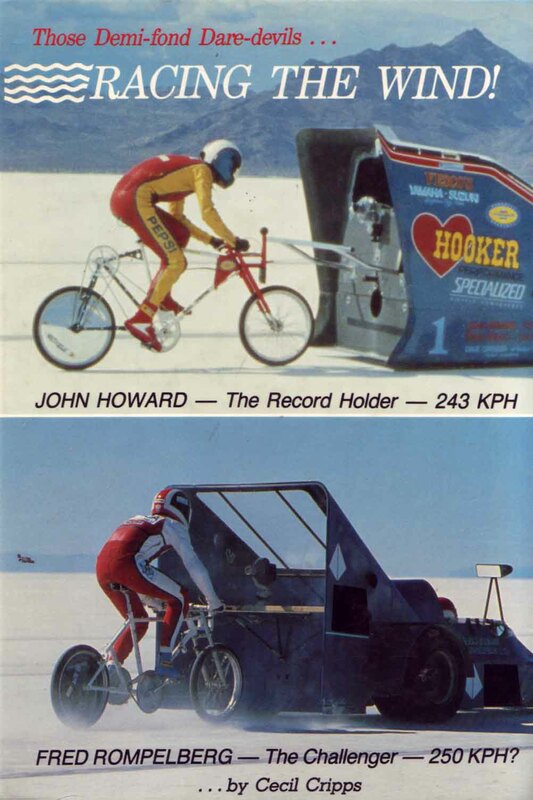 Besides, the paint scheme as it was did have its advantages. Here´s a view of the headtube treatment with the Thanet star brazed onto the tube as a head transfer replacement and the “S”-shaped lugs. Hilary Stone´s book on Thanet (“Ease with Elegance”; wonder if it is still in print) says Les Cassell, the founder of Thanet, was an avowed socialist so he chose the star for his bike´s logo. 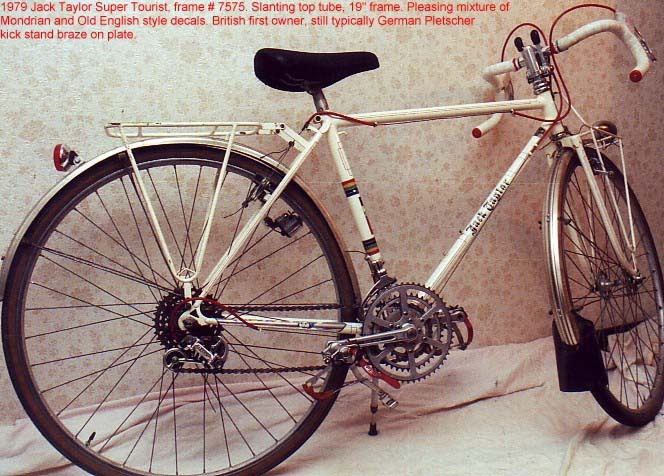 The Cyclo rear derailleur was one thing I still had in my box, and the rare Allez! 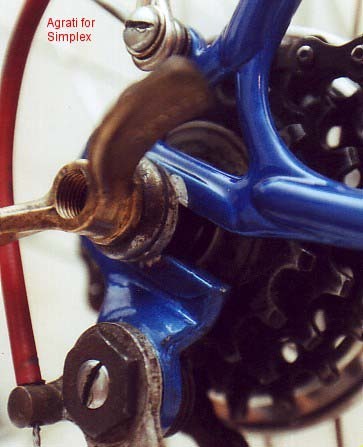 alloy cranks, chainring and pedals came from Hilary Stone – on two different occasions. One more happy coincidence. 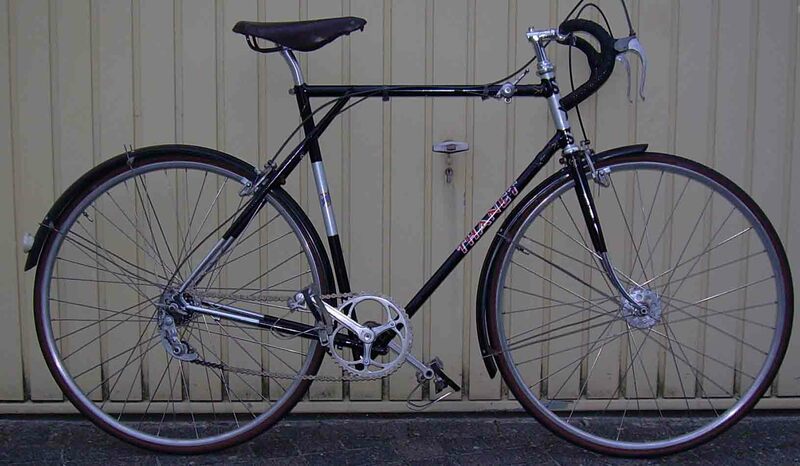 He did say he´d never seen them on a Thanet, but then they were about the lightest ones around at the time, and the Thanet as it is now weighs in at about 11.2 kilos, not bad for a bike its age. In Britain, SLs were considered to be the lightest frames of their age (don´t know what some French builders would say to that, though), and the weight of mine certainly does not counter the claim. 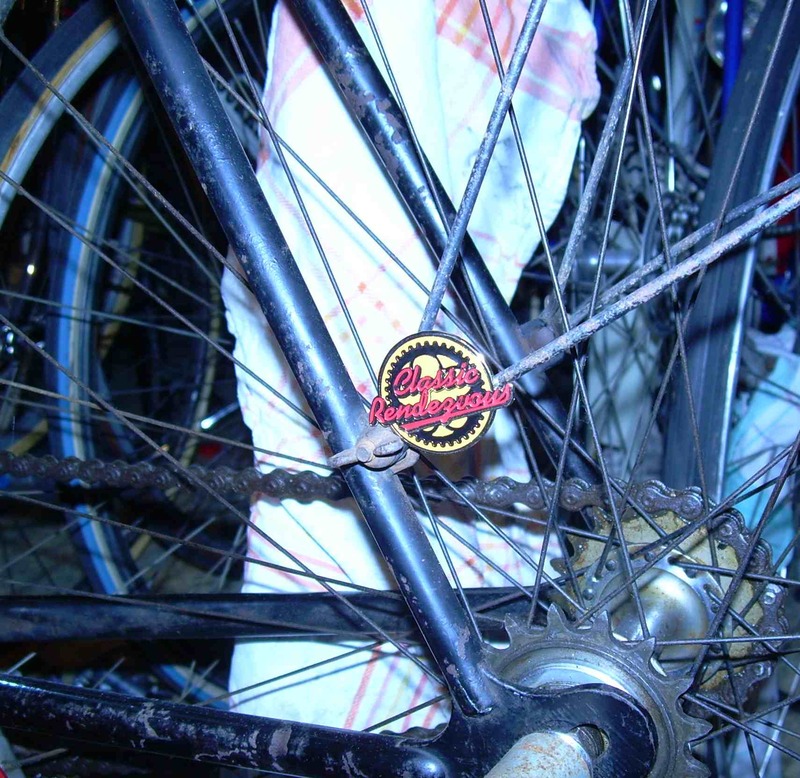 The wheels that came with the bike had these wonderful Haden hubs of fragile annular bearing fame, laced into 27″ Conloy rims. The rear hub even is a free/fixed version. The problem that remains to be solved is the headbearings – they are 1980s Campag, not easily replaced with period correct items because of the press fit diameter. I guess it´s about time I explained a few things – like the strange post titles. Simple: I´m afraid that too many uninvited people might look and perhaps even steal photos for fraud purposes. That´s why I keep bike names out of post titles. What I´ll do from now (well, not right away; it´s getting late) is that I´ll have a table of contents in my “about” profile in the top left corner of the page. I´ll keep it up to date to make life easier for readers should they want to find specific bikes again after some time. Why this now, why this at all? I´ve discovered what the “stats” are. Don´t laugh; I´m the haptic type, I´m just not made for the internet. I have found that this blog has had more than 1,200 hits so far, which has bowled me over, and I must add that I feel really flattered. Had people asked I would have said “Maybe a dozen”, judging from followers and commentators, but 1,258 – wow. It seems there are readers from places like South Korea and Hungary, the Dominican Republic and Australia. Most are from Germany, strangely enough, but the US and the UK are close behind, so I´ll keep posting in English. I enjoy writing in English and at the same time I can keep my proficiency level up which I need for my job. Also if there are people reading this who can explain why there´s 201 readers one day and 4 the next, or why there are 12 people one day, out of which there are 10 Belgians, that nation never to feign any significant interest in my blog afterwards – please write a comment. I´d love to find out more about this fascinating medium. Thanks. Oh, yes, forgot: HAPPY 35TH BIRTHDAY, APPLE ][ ! I guess it´s a bit late, but then, better late than never. Members of the CR mailing list will recognize large parts of this post, but perhaps some of you are no members or, if you are, have a short memory. 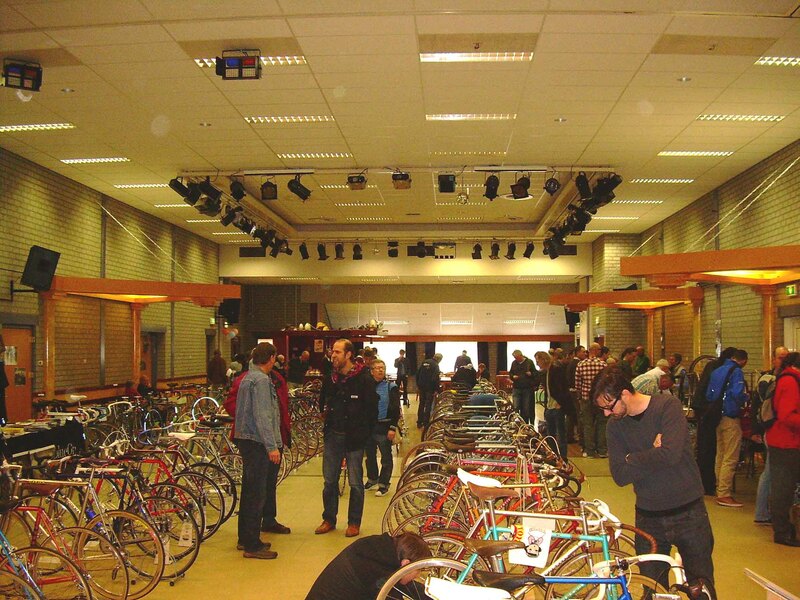 I don´t visit many old bike shows or meets, firstly because there aren´t many around here, and secondly because during the season riding as many sportives/centuries as possible for me is more important than getting yet more bikes and bits. This rules out most events like the German show which is near Düsseldorf, and in May, or the fantastic Retro Ronde in Belgium, mostly in June. But Neerkant is relatively close and just outside the cycling season proper, and as we have visited all of the Stalen Ros shows it has become somewhat of a tradition for us. So my son, a friend and myself entrusted ourselves to my nearly 21 year old Volvo 740 estate and drove the 240 km from Osnabrück, Germany, to Neerkant near Venlo, Netherlands. We spent a day of brilliant spring sunshine in the car, and as it turned out, weren´t so sure in the end if we mightn´t better have used the weather for cycling. We felt that we had been spoiled that much by the wonderful shows in preceding years, Maarsen and Rotterdam included, that there was not much news this year. The organization was friendly and perfect as always, and we met a number of friends and acquaintances. There were people from all European cycling nations and even an attendee from the US, and new friends just queued to be made. For this, meets like Neerkant are unbeatable, but this time it also seemed that it was for spares prices. It was possible to score some nice items early on, but those were soon gone. Besides that it was NR and cheap Shimano over and over again, ad nauseam, and not much really interesting stuff. I noted many downright worn out or broken items this year – why do people bother, I wonder? Was it just bad luck or are things wearing thin? Also it was quite a challenge to keep ahead of professional buyers. The exhibition was a little less well stocked than on the preceding occasions, it seemed to me, but there were some stars. The idea was that people brought their French bikes this year, and there was quite a number. 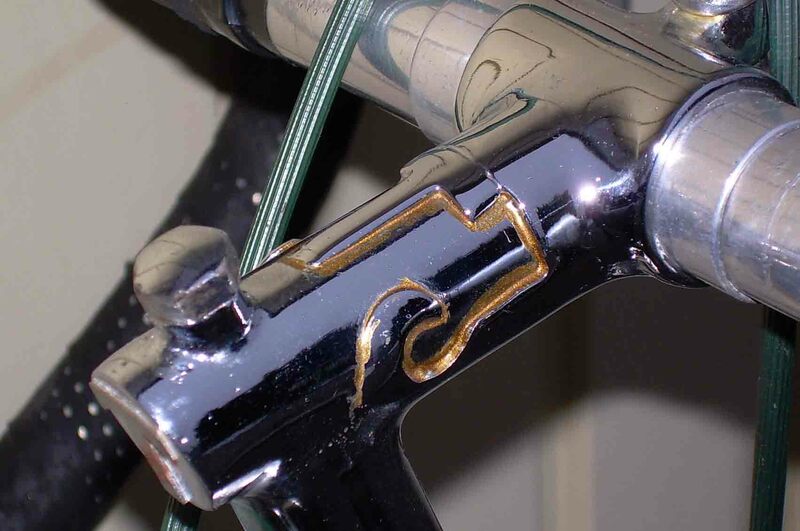 Perfect PX and PY 10s, gold anodized bits and all, Alcyon, Hirondelle, you name it. I guess the toppers were two Alex Singers, c/w all the goodies. One had a tablet computer inserted in its handle bar bag´s upward facing map compartment so that you could watch a slide show – weird. Neerkant definitively was one of the very few places in the world that weekend where you could discuss the relative merits of different Masis and Singers, Peugeots and Gitanes, artsy paint styles and parts combos, and all you had to do to give examples was to walk five or ten meters. 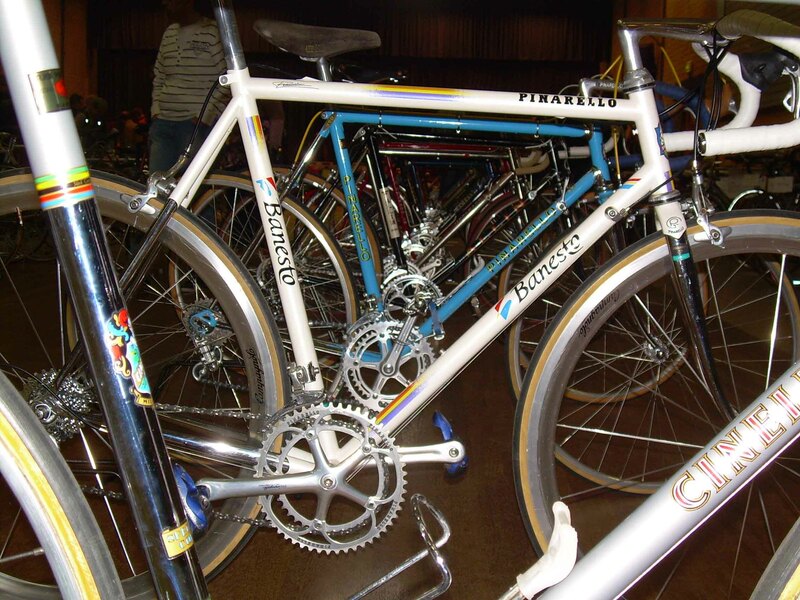 However, there were a number of old friends among the bikes, too; the usual suspects were all there, and Italian steel abounded, for better or for worse. Will I go next time? I guess so. If there´s good weather, though, I´ll definitely take a bike for riding, too. The photos were taken by my son. No, it´s not the bike which I find embarrassing. What it is you´ll have to find out by yourselves – I won´t tell. Only this much: It has been rectified by now, I haven´t a clue how I could have made the mistake in the first place, only I didn´t want to re-take the photos. I bought the restored but otherwise naked frame years and years ago from Hilary Stone; I couldn´t resist as it is nearly my size, and as it turned out it rides really well. 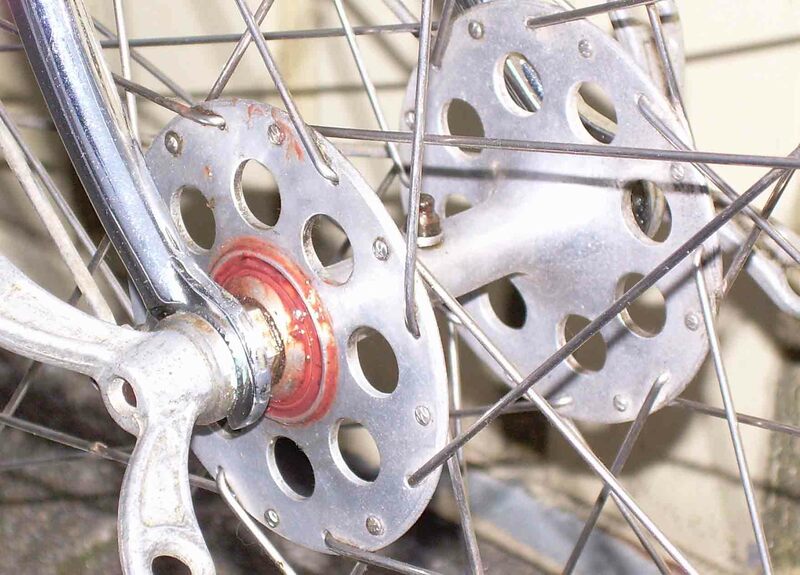 I was lucky enough to still have had many spares from the mid-fifties which I could put straight on the frame; the Blumfield hubs came from Hilary, too. If you look closely at the front mudguard you´ll notice that it is very long, has the Bantel stamp but no mudflap. 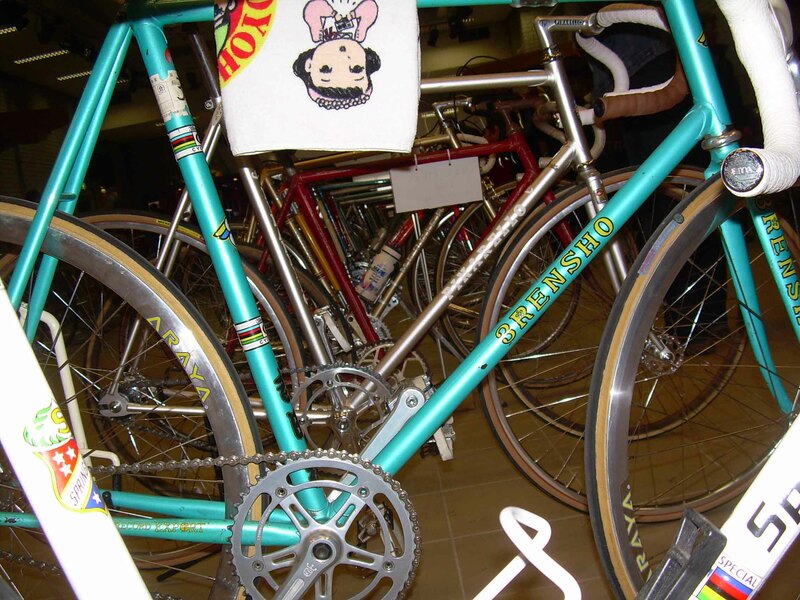 This is the story: About twenty years ago, maybe a couple more, I was able to secure the remaining inventory of a very old cycle shop in my home town. Much had already been binned when I realized what was going on, but there was some left which I could have for taking it away. Among all the bits there was quite a number of very nice guards, mostly Bantel, in many colours. There were two red ones, both were rears, and one had a few inches of one end broken off, so when I built up the Gillott I just took the broken rear and filed a spearpoint end. It doesn´t look too bad, actually, passes the three foot test any day, but the big giveaway is of course the rear mounting bracket which sits behind the fork crown. The Simplex has an alloy arm and came off a French scrap yard. Simplex sold a licence to a Bielefeld, Germany, firm to produce their stuff for the German market, and in another shop I cleared about 15 years ago there had been a great number of German gear levers, but now I have a correct French one. The Frame itself is quite a rarity; it seems that the combination of taper tubes and fleur de lys bilamination sleeves was only done four times. They are no lugs; it´s the same system Claud Butler used a lot (there´s a 1948 International coming up which has the same system). 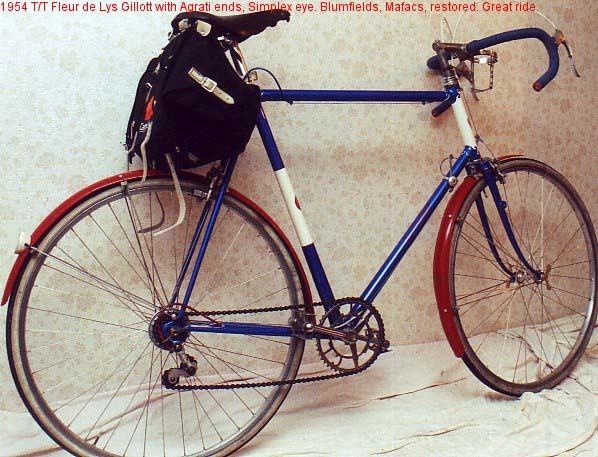 You can see this in the next snap: There´s a strengthening sleeve on the top tube, but if it were a lug it would also cover the top part of the seat tube – which it doesn´t. People are not quite sure whether the sleeves were done for embellishment or strengthening purposes; I like to think both applied. 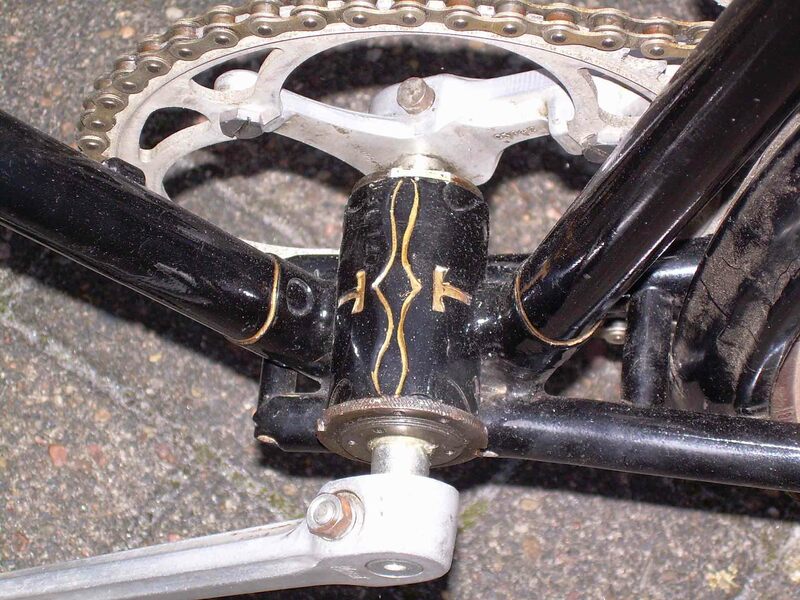 It is obvious that this lugless construction gives you free hand with angles, and of course finding lugs for the taper tubes (down and seat tubes have larger dia at the bottom bracket end) would have been expensive and difficult. Very nicely cut bilam sleeves, great design, present yet not overdone like on many Hetchins frames. 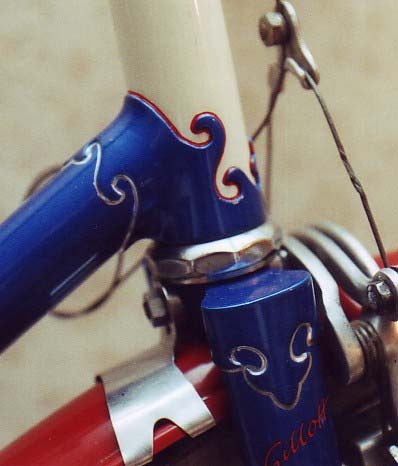 Lastly here´s a photo of one of the rear dropouts; it´s Agrati with a Simplex derailleur eye. Nothing else will fit, so I was quite pleased to have the alloy derailleur in my box. I have nearly made up my mind to take the Gillott to England this summer where I hope to ride in the July 14 Oxford lightweight run. But then again I know it´s quite hilly over there, so maybe I´ll take something with lower gears after all. The latest issue of Bicycle Quarterly has arrived, and as always I´m reading it cover to cover. I find the mixture of history and modern cycling riveting as my personal approach is just that: I don´t buy a cycle new from the shop but always try to choose those parts, new or 40 years old, which suit my needs best – see my Ellis-Briggs Randonneur further down (on which I covered another 80 km today in beautiful spring sunshine riding an audaxed permanent). Page 6ff in the new BQ has an interesting article by Constance Winters of the Lovely Bicycle! blog. She discovers a new way of cycling, that of riding a randonneur bicycle. Good for her. She also fits well in the main topic of the BQ issue, outsize or very small frames. I can say that I have had a fair amount of ado with too small frames during the last 30 or so years, and my wife has just the opposite problem. So what better time than now to post her ca. 1979 Jack Taylor Tourist. This must be one of the nicest and most unusual cycles in our basement. 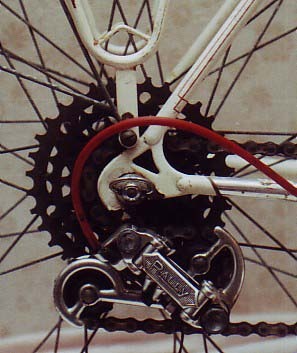 The parts combo is original, it seems, showing quite well that the Taylor brothers didn´t believe in the groupset approach. Look at the derailleurs: Front Suntour, rear Campag Rally, levers Suntour again (on handlebar stem). The carrier racks are Taylor made, there´s Sakae Randonneur handlebars and a Unica Nitor saddle. Hubs are Record and rims 27 inch Weinmanns. Brakes are Mafac Cantilevers. 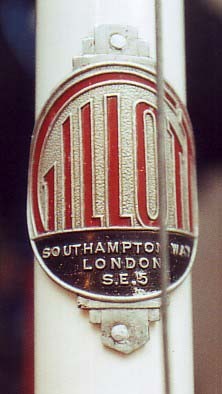 Note the sloping top tube, made possible by the lugless construction which was used a lot by the Taylors. The frame as such is simply beautiful – box lined, a mix of Mondrian and Old English transfers. Strangely, the spokes are zinc plated. How they hit on this for such a nice bike remains a mystery. Also lighting is 1970s basic: Simple, inexpensive, ineffective. French bottle type dynamo, simple German front and rear lights. Sorry to say that my wife doesn´t use the bike much now, so it is in storage as can be seen from the chain position. This used to be different; under our ownership the Taylor saw service in several European countries. The strange thing is that we believe that we had already seen the very bicycle about ten years before we got it. Some 15 years ago from now there was an ad in the Tandem Club Magazine to which we responded, and when the box arrived, we were speechless, not only because of the quality and beauty of the Taylor, but because we both were certain right away that this was the bike we had marvelled at when touring in the UK on very simple and inadequate equipment. We had decided to use the train for some distance after having cycled a Roman road from the South West up North because we wanted to visit friends. And there it had been, in the guard´s van, a real eye opener. Received the v. nice cloisonné pins last week and already had a lot of fun with them. First, I thought it might help streamlining my ca. 1937 Ellis Briggs. 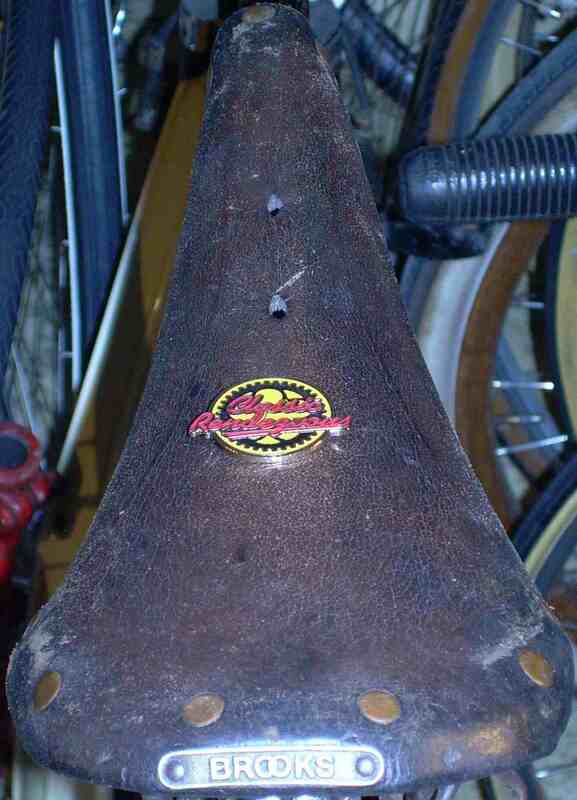 Next, I thought one might improve the riding comfort of a Brooks Narrow with it – didn´t do any harm.